It's no mystery that millennials are changing the workforce and quickly rising up the ranks. By 2030, millennials will be approximately 75 per cent of the global workforce. Based on numbers alone, Millennials are accelerating change and growth in the office. Conventional commentary about this generation credits millennials as being energized, open-minded and community-based. At their worst, they are perceived to be selfish, entitled, and prone to jump ship. These misconceptions give millennials a bad reputation. In truth, millennials are becoming the leaders we need for tomorrow's solutions -- without the handholding of previous generations. Before we explore how the younger generation is managing up and succeeding in the workplace, let's get a few facts straight. Millennials, defined as those ages 18 to 34 (in 2015), are on track to being the most educated generation and are distinguished as the first wave of digital natives in the workforce, according to an IBM study. The idea that millennials expect endless praise and every opportunity to be handed to them is not true. In fact, they desire transparency, to be heard and treated fairly. One example of millennials at the helm is the youthful founders of Snap Inc., a digital camera company. They are pushing more aggressively than predecessors to transform a scrappy start-up to a public company. The 26 year-old CEO declined to bring in "adult supervision" or senior counsel to plan the company's initial public offering. Instead, he is defining a new way to execute their IPO valued at more than $25 billion. Even at my company, I've witnessed the younger generation succeed at proposing innovative ideas, incorporating new business practices, and gaining the trust of our collaborators and partners. Here are a few ways Millennials are using their unique skillsets and behaviors to exceed expectations and show older generations how to push beyond their boundaries. Millennials are naturally fluent in technology. They easily incorporate technology into their job to create more efficient workflows. This gives millennials an immediate advantage in the office - they can find answers to complex questions in seconds, feeding their need to be more creative. What seems to be superfluous or optional gadgetry for baby boomers is often required for millennials. 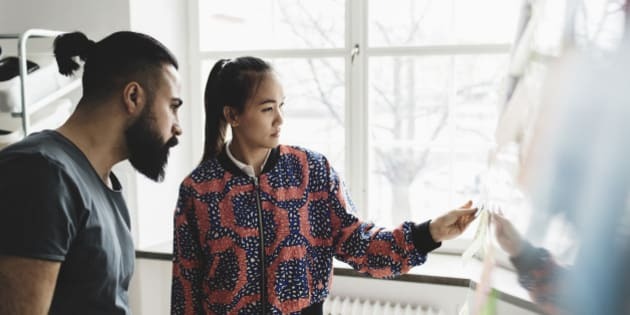 While baby boomers are eager for their company to adapt new technologies, they often lean on millennials to integrate new ways of doing business into everyday operations. This generation is also motivated by the prospect of making a positive impact. Millennials seek out roles where they can feel fulfilled and make a constructive difference in their business - and the world. In fact, 56 per cent say their organization's purpose is why they wanted to work there. They want to better understand the company's big picture, prove their worth and work towards loftier goals. Baby boomers tend to be more focused on near-term objectives; they pay attention to more traditional and tangible incentives (raises, more office space, new title) and short wins to advance their career. Millennials can inspire their managers and keep them focused on the organization's greater mission and purpose. The noble aspirations of millennials can set the bar higher for innovation. At OncoSec, our mission is to pioneer new cancer treatments for patients. Scientific innovation is at the core of what we do, so it's paramount to encourage all employees to think like a millennial and think big. To that end, we developed educational resources to clearly communicate the company's vision and illustrate how each employee's role contributes to achieving our mission. Millennials are proving that they don't need intense supervision as previously assumed. In reality, you may find that millennials are teaching older generations a thing or two about enhancing a business. Baby boomers and generation X should look for ways to embrace millennials and give them room to incite change. As the workforce becomes more virtual, competitive, and diverse each day, create environments where millennials are heard and valued -- you may start to see a positive impact sooner than you think.